Have you applied for a market – and been accepted? Are you psyched to share your wares to the real-life public for the first time? Then read on, we’ve got a quick-fire guide to preparing for your very first market. Etsy Shops: Fluid Ink Letterpress, Mini Ink Fingerprints, and Mini Ink Photocards. Davina is a stationery-obsessed graphic designer with a love of vintage machinery – so naturally, she creates amazing hand-printed paper goodness with her letterpress. 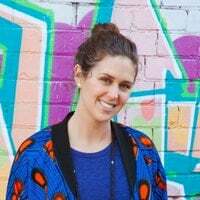 Since her first market in 2010, selling a small sample of her products, Davina has become a market enthusiast, attending at least two each year and coordinating the Perth Etsy Made Local as part of the WA Etsy Team. Your inventory is ready to go, you know (however vaguely) what will be included in your stall’s set-up: now it’s time to list out exactly everything you’ll need on the day, so you’ll have all the important details at hand so you can whiz through the day stress-free and feeling prepped. You’ve got your stall set up, packaging, and products – that’s it, right? Not quite! A few extra bits and bobs will help you have a smoother day: a comfy chair, a portable battery/ phone charger, a card reader to take credit card payments, a stock list so you can keep an inventory of what has been sold, snacks, sunscreen, a thermos, business cards and any other marketing material like signs and banners. A market needs one thing to be a success: people. Get the word out before the big day using all of your networks: social media, real life friends and family, online communities. Customers will often shop and then Instagram the pieces that they purchased – so make sure your Instagram handle is with them when they walk away, whether that’s on the packaging or on a business card. Need more in-depth advice about prepping for a market stall? Check out our comprehensive guide what to expect at your first market. Just did my first Etsy market this July. Starting a list and adding to it as preparation went on was certainly helpful for gathering everything needed the night before. Our team captain, Colin, was amazing in helping everyone get organized as well. It was a great experience to meet customers face to face, as well as other sellers. So glad you enjoyed your first Etsy market, Anita!